I spent some time in the garden this morning and it inspired me to write about one of my favorite vegetables....…kale. Kale is not only a beautiful vegetable it is also very nutritious. The Center for Science in the Public Interest, a non-profit consumer advocacy group, took the challenge of finding the most nutritious vegetable. They rated vegetables based on many nutrients, including calcium, iron, folate and fiber. The winner? You guessed it, kale. One cup of kale has only 36 calories and zero grams of fat. It contains nearly 20% of the RDA of dietary fiber, which prevents constipation and lowers blood sugar. Kale is full of antioxidants and phyto-chemicals which are known for their cancer fighting properties. It is also loaded with omega-3’s which provide anti-inflammatory benefits. 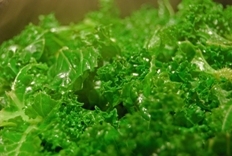 Kale is a good source of calcium, folate, lutein, fiber and vitamins A, C, E and K.
Not sure how to cook kale. One of my favorite ways to eat it is roasted in the form of crunchy kale chips! Just follow the recipe below. Try it once and you’ll be hooked. Wash in cold water and dry in a salad spinner. Toss with olive oil and spread out on cookie sheets. Drizzle with a little more olive oil and some kosher salt. Bake for about 15 minutes, until edges are brown and kale is crispy. Enjoy!